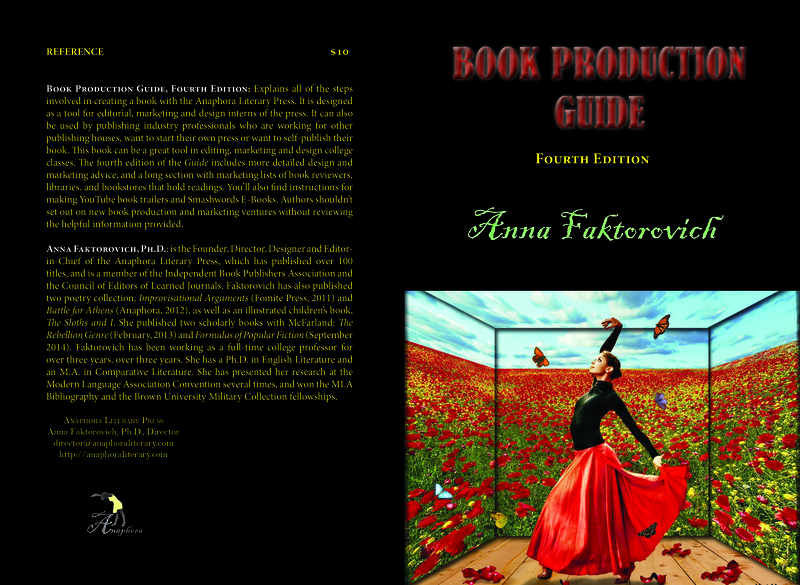 Book Production Guide (Soft Cover: $10, ISBN: 978-1-937536-25-1; Smashwords Edition: $2.99, ISBN: 978-1-310227-87-5; Nook Edition: Free; LCCN: 2012907287, 138pp, 6X9″, October 2014, 4th Edition; Purchase on Amazon or Barnes and Noble): Explains all of the steps involved in creating a book with the Anaphora Literary Press. It is designed as a tool for editorial, marketing and design interns of the press. It can also be used by publishing industry professionals who are working for other publishing houses, want to start their own press or want to self-publish their book. This book can be a great tool in editing, marketing and design college classes. The fourth edition of the Guide includes more detailed design and marketing advice, and a long section with marketing lists of book reviewers, libraries, and bookstores that hold readings. You’ll also find instructions for making YouTube book trailers and Smashwords E-Books. Authors shouldn’t set out on new book production and marketing ventures without reviewing the helpful information provided. Anna Faktorovich, Ph.D.: is the Founder, Director, Designer and Editor-in-Chief of the Anaphora Literary Press, which has published over 100 titles, and is a member of the Independent Book Publishers Association and the CLMP. Faktorovich has also published two poetry collection, Improvisational Arguments (Fomite Press, 2011) and Battle for Athens (Anaphora, 2012), as well as an illustrated children’s book, The Sloths and I. She published scholarly books with McFarland: Rebellion as Genre (February, 2013) and Formulas of Popular Fiction (August 2014). Faktorovich worked as a full-time college professor for over three years. She has a Ph.D. in English Literature and an M.A. in Comparative Literature. She has presented her research at the Modern Language Association Convention several times, and won the MLA Bibliography and the Brown University Military Collection fellowships.